The Toshiba Satellite e205 is a pretty amazing notebook. Most of the issues I discovered during my use were minor and dont take away from the fact that this is a powerful notebook that is perfect for college students. It would be great if the notebook had all-day battery life, but given all you can do it is acceptable. Theres no denying that the wireless streaming is an incredibly cool feature and one that really makes the device. If you love to consume media  online, on your notebook and on your HDTV  then the e205 is perfect for you. If you find yourself editing a clip for YouTube or touching up a few photos, itll do that too. The Toshiba Satellite E205-S1904 all-purpose laptop, currently a Best Buy exclusive priced at just under $900 (as of March 17, 2010), offers some nifty features, such as the option to connect the laptop's display to your HDTV wirelessly through an HDMI-equipped peripheral. On its own, the Satellite E205-S1904 is an average laptop, but its Wireless Display capability is pretty cool. We enjoyed using the E205 and could easily envision it becoming our go-to laptop when we are out and about, if it weren't for the disappointing battery life--which for us is a deal breaker. We also would have liked to see built-in Bluetooth, support for Ethernet Gigabit, and better-sounding speakers. The E205 offers a decent balance between performance, price, and features--as well as a nifty new technology--but we can't help thinking that one too many compromises went into its crowd-sourced design. It's hard to contain my excitement every time a laptop maker takes a plain-looking laptop and showcases an exciting new technology. 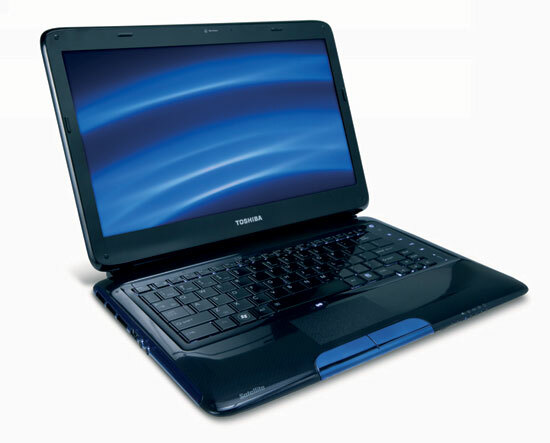 Case in point: the Toshiba Satellite E205-S1904 ($999 list). The Toshiba E205-S1904 is a speedy one, created under the direction of, and sold exclusively by, Best Buy. The Toshiba Satellite E205-S1904 is budding with potential, thanks to a backlit keyboard, Core i5 processing, and Intel's WiDi technology. The Toshiba Satellite E205 is one of the nicest 14-inch consumer notebooks we have reviewed in a while. It offers an excellent modern design, a great color scheme, and very useful features. Wireless technology has come a long way in the past few years with Wireless USB usually being mentioned the most. Unlike Wireless USB, Intel Wireless Display actually works very well. At this year's CES, one of the technologies that captured our interest was Intel's Wireless Display technology, or WiDi. Presented as a simple plug-and-play way of transmitting a laptop's video signal to any TV with the help of a small Netgear-made box, WiDi presents a tempting solution to the often messy methods currently available to those who want to get their Hulu on the big screen. As one of the first laptops to feature Intel's Wireless Display technology, the Toshiba Satellite E205-S1904 is a slim, fast, and affordable package for mainstream users. Toshiba's Satellite E205-S1904 is a stylish 14.1-inch notebook that offers a surprising amount of cutting-edge technology given its low price ($899, at the time of our testing). This Core i5–powered unit, available exclusively at Best Buy stores, is an excellent general-purpose notebook with a bonus sure to appeal to HDTV owners: It's one of the first to support Intel's Wireless Digital (WiDi) technology, which sends video wirelessly to a receiver you can connect to your HDTV. Wireless video support makes the E205 work well with your entertainment center. Plus, this laptop is fast and feature-packed. This stylish and innovative notebook offers strong performance and can wirelessly stream high-def video to your TV. Toshiba and Best Buy did a lot of things right with the Satellite E205. For a reasonable $899 users get a sleek, futuristic notebook and strong performance, backed by Intel’s new Core i5 processor. The integration of Intel’s Wireless Display technology, complete with Netgear’s TV adapter box, make this 14-inch notebook particularly compelling.